Alice Shepherd, an 'expert citizen scientist' says that one of the best things about crowdsourcing science is that she knows she is making a difference. She also likes the fact that anyone can take part in a citizen science project. 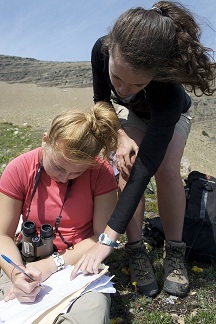 Have you ever taken part in a citizen science project before? Is the FWW your first? What do you find rewarding about being part of this project? I am completely new to the idea of citizen science, and this is the first project I'm taking part in. I like that I can help such important research with so little formal training, and without spending lots of time every week. I also really like feeling that I am contributing to something which will help the spaces I live in and love. Hello: I am a teacher workin with eleven-years-old students. We are involded in the Water explorers project, and they are very enthusiastic so far! We are learning a lot. I think this is a really fantastic idea, because we can be a small part of a huge change. And this is what makes a difference. We hope that our tasks helps to improve our community behaviour towards fresh water resources. 3) My children are fascinated by learning more about fresh water sources and taking part with the data gathering.